If U.S. citizenship was granted based on how “American” one feels, I would have been naturalized the day after I arrived to this country from Venezuela. However, as you may suspect, it does not happen that way. Personally, my path to citizenship took 10 years. Many people think that to move to this country, you either need to invest a half-million dollars and go with the widely known EB-5 program, or have a U.S. spouse, parent, sibling, or child over 21. I had none of that. In 2006, Miami Dade College sent me an admission letter to study English. 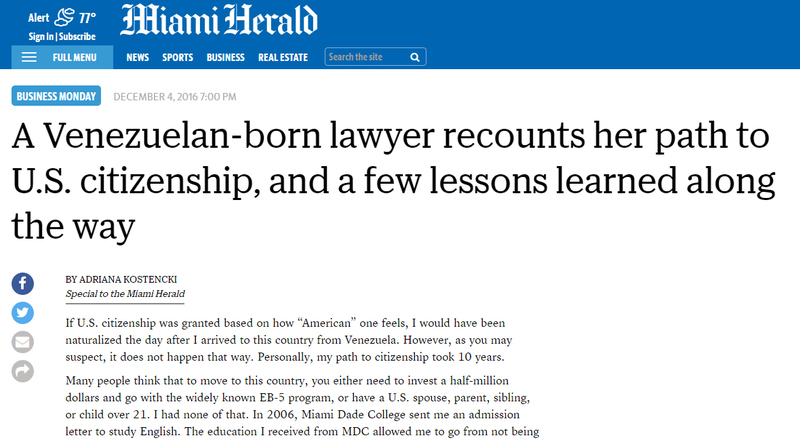 The education I received from MDC allowed me to go from not being able to structure more than 10 sentences in English to transferring my student visa to the University of Miami School of Law to pursue a juris doctor degree in 2008. While pursuing my law degree, I searched for jobs and received an offer from a Florida law firm. However, I had to get a work visa before I was able to take the position. My only option at the time was for the employer to file an H-1B non-immigrant petition on my behalf.